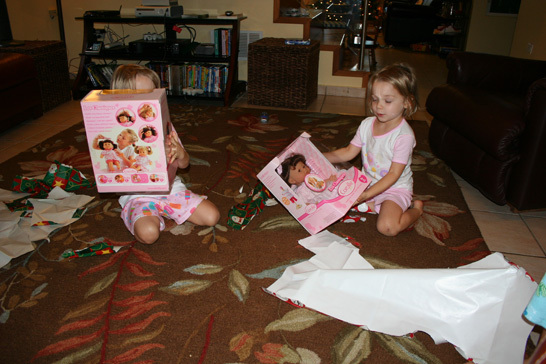 Posted December 29th, 2008 under All in the family, Around the house, Church, Clara and Libby, Life, School by MicheleP. My Birthday Week – this really deserves much more than a bullet – not just because it was my birthday week, but because my husband went totally and completely out of his way to make the day week special. I had 7 full days of birthday celebrations and presents complete with flowers, special meals, awesome gifts (hello new pink ipod) and even a Saturday morning all to myself with nothing but a box of Lucky Charms to keep me busy. It was: Blissful! The girls had their Christmas program at school. Actually – it was much more than just a Christmas program. 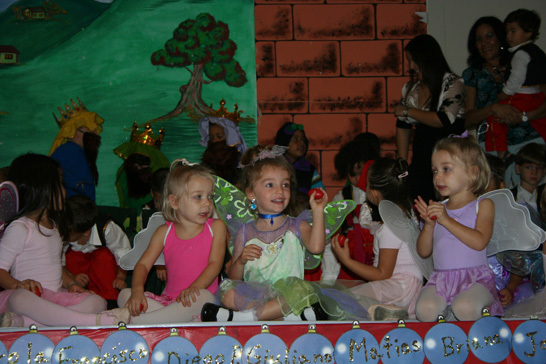 In addition to the standard Mary, Joseph, Angels & Baby Jesus we had many colorful butterflies as the little girls showcased their ballet “skills”. 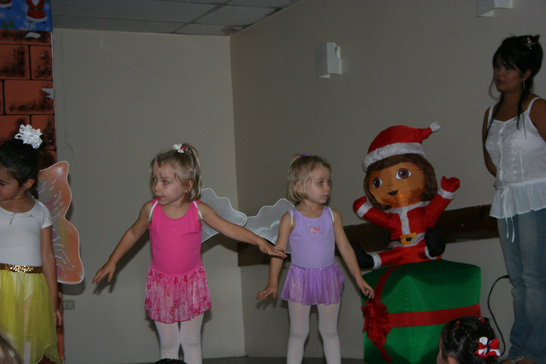 I guess it’s just easier and more economical to have the ballet recital alongside the Christmas program. 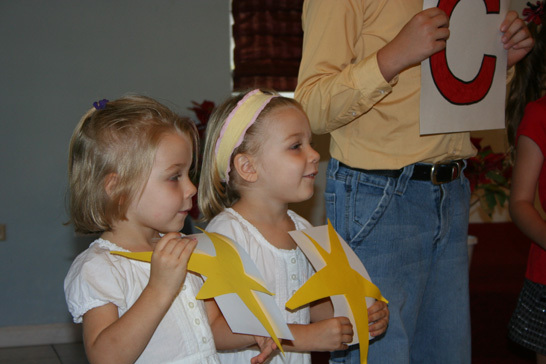 The girls also were in a Christmas program at church. However, no butterflies at this one. We hosted a visitor from Texas. He was by far the easiest guest we’ve had to date. 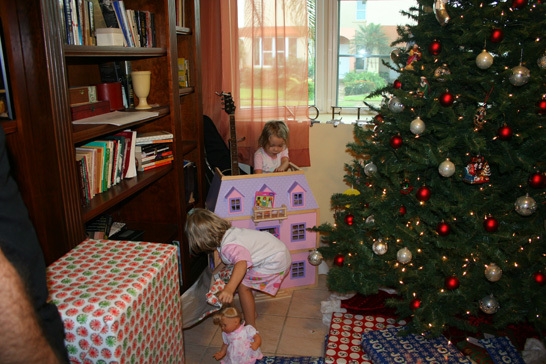 The girls could hardly sleep the night before Christmas and were thrilled the next morning to find that Santa did indeed come to Puerto Rico! And there you have it. Bring on 2009!! I completely understand the google reader piling up! These are fantastic pictures, and a great re-cap. 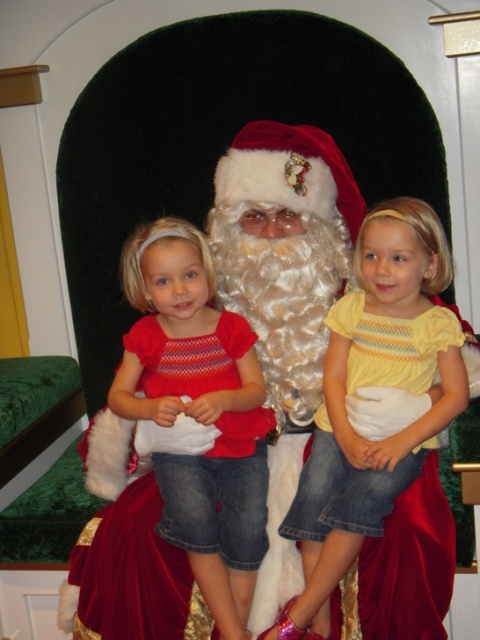 I LOVE the picture of the girls on Santa’s lap. Both of them have their ankles crossed. And you can really see that they are starting to look older. The picture of the girls with Santa is adorable. They are so big now! Precious! Finally…I’ve missed your bloggings (is that a word?). I’m glad you guys had a good Christmas. Wow, your girls are so adorable!! And I love your birthday week. I am a birthday fan….celebrate as long as possible!! 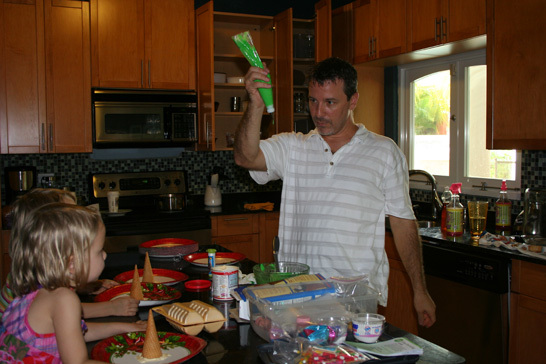 So, even though I am totally crazy…..we are doing good on the no paci and no diapers! God has given me a load of grace, that is for sure. But also Christmas break is a good time for us…..its when we are the least busy with ministry, life, etc. So I kind of was happy just to knock it out. Caleb is not trained during naps/bed, but he is doing well during the day! 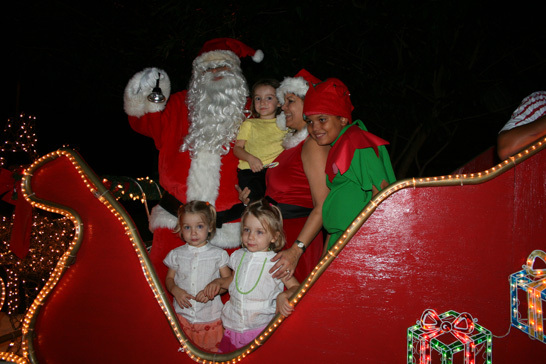 Funny to see the girls with Santa in shorts and summer tops, lol. They do look so cute though! I can’t believe I missed their Christmas Show!!! Were they singing in Spanish? We need to get together soon… Happy Holidays! T – they sang most songs in Spanish but a few in English too. I don’t think the girls knew any of the songs all the way through but sang out on the ones they knew..
“Si me ven, si me ven. 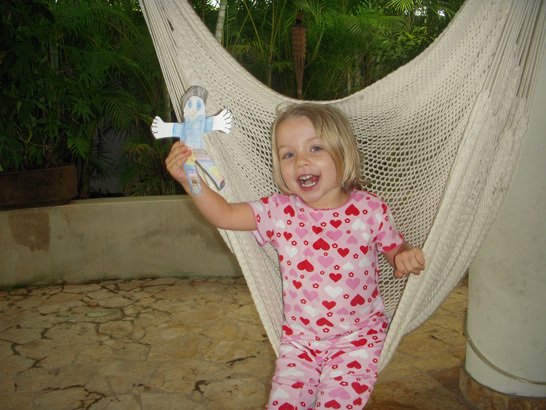 Voy camino de Belen” (this is Clara’s favorite song and she sings it EVERYWHERE we go. I am happy to see that you had a wonderful Christmas and I wish you and your beautiful family all the best for 2009. Feliz Año Nuevo from San Juan! SO happy to have an update! I was wondering if you had decided to finish with your blog Love the picture of the girls with Santa – they look so grown up! Your house looks great. Was it a little weird to have an evergreen tree in the midst of humidity? That was always weird for me in Sing. 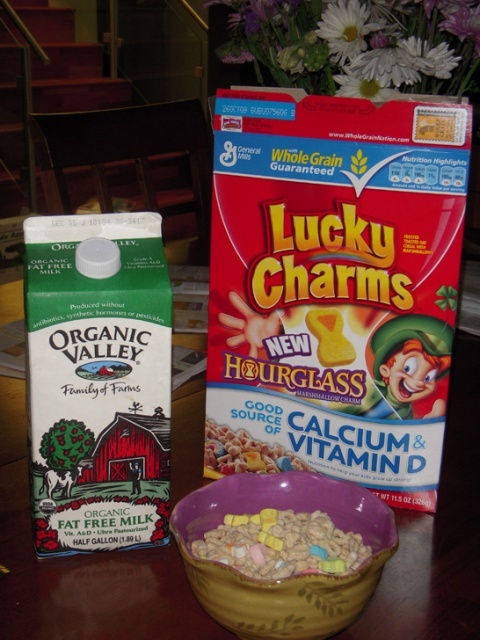 I notice almost all the comments are about the girls, who are adorable… But no one noticed the organic (fat free) milk with the Lucky Charms? That just cracked me up. Lucky Charms would have to be my all time favorite cereal!